The Last Learning Lab of the Year! Last week saw Learning Lab 3 being delivered and sadly, it was the last one of the academic year! The Learning Labs are all about getting teaching staff together from different areas within the school and offering the chance for professional conversations to flow and for the latest in educational research to be explored, debated and applied! Session 1 � Hattie�s concepts of Teacher Efficacy and Self-Reported Grades. 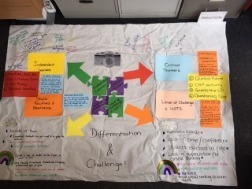 Session 2 � Differentiation at Highcliffe School. Session 3 � Dedicated Coaching Reflection led by Stuart Barnes and Gary Mant. 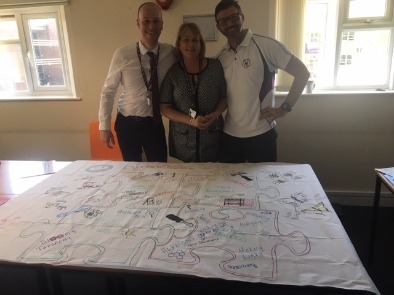 This particular Learning Lab was slightly different to previous ones as it also involved a team building activity linked to differentiation � the design of a tablecloth! This seemed to go down very well with the three Learning Lab groups (and Lead Practitioners!) getting increasingly more competitive as the week went on. 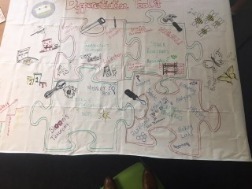 See below how Differentiation has been �mapped out� by the Labbers' this year! A positive end to a really positive experience.